Over this past week my first tour group and I have been super lucky to see everything Alaska has to offer in terms of photographic possibilities and some of the most challenging shooting conditions I have seen up here. Over 5 days we have seen everything from a full blizzard to perfect sunny conditions and almost everything in between. For only the second time since 2005 I had to cancel a shoot in Alaska due to a blizzard that slammed into the area with 45 mph winds, 10 foot waves and snow and ice coming down sideways just as we were gearing up to leave for a shooting session. Eagle inverted right before a dive, Sigma 50-500mm F4.5-6.3 APO DG OS HSM @ 340mm, Nikon D4, manual mode, 1/1600th s at f/8, ISO 400, Manual mode, handheld. 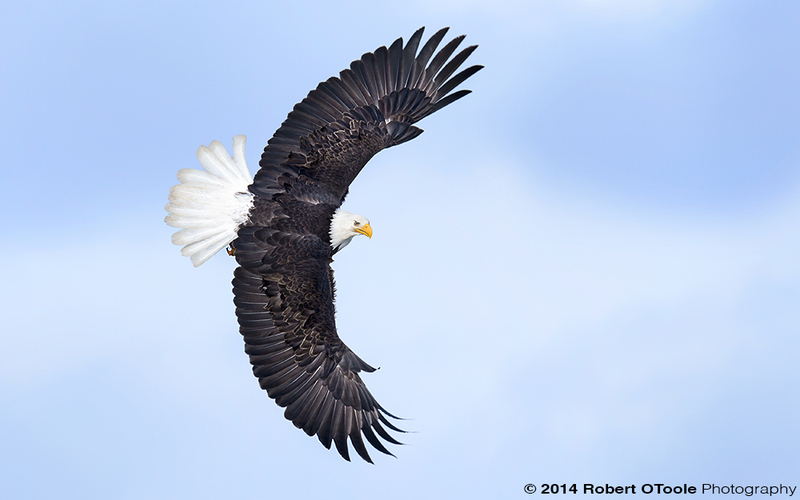 Eagles seem to enjoy aerial acrobatic flying. They will often throw themselves into an upside down position at the top of a climb, as you can see above, to redirect straight down into a steep dive. Sometimes if you are lucky to be close enough you can hear the wind rush off their wings in a low roar as they shoot by. Sometimes you can actually feel this rush of wind if are right below them. Over the next few days after the blizzard we had great opportunities with clouds, snow, wind and even beautiful sunny conditions on the last day of the tour. On the last shooting session of the tour the participants had enough of shooting and literally called it quits completely worn out by all the continuous action over the last couple of days. The group all had huge smiles on their tired faces as we headed back on the last session of the tour. Eagle wing up threat pose, Sigma 50-500mm F4.5-6.3 APO DG OS HSM @ 500mm, Nikon D4, manual mode, 1/500th s at f/8, ISO 500, Manual mode, handheld. When an individual eagle lands near a group they sometimes land with wings straight up, beating only the tops or tips of their wings while calling. This threat pose is always great to see but can be very hard to catch unless you are looking out specifically for this pose. After years and years photographing eagles I have only been able to capture this behavior a half a dozen times or so I was really happy to see this opportunity for my group. Eagle inverted, Sigma 50-500mm F4.5-6.3 APO DG OS HSM @ 210mm, Nikon D4, manual mode, 1/40th s at f/8, ISO 100, Manual mode, handheld. 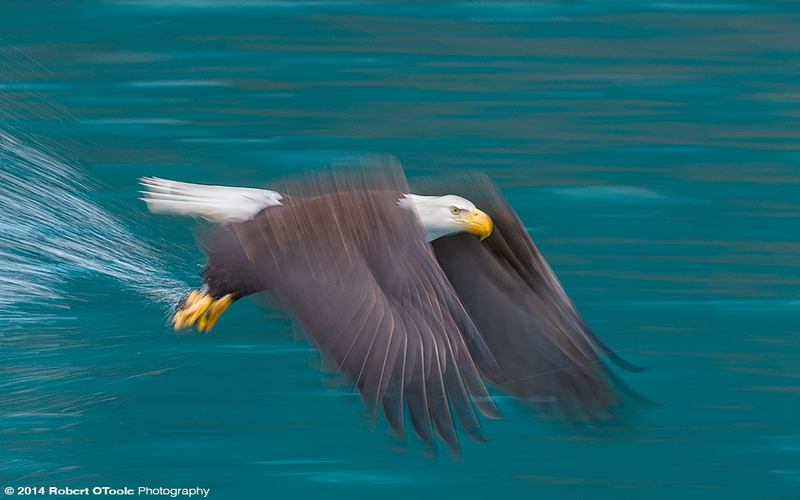 Low light levels and deep dark backgrounds makes for great opportunities for speed blurs. The low light makes it possible to use low ISO levels and the dark background in the image above makes details in the eagle really stand out. 1/40th of a second gives you just enough blur to show the speed of the subject. Eagle inverted, Sigma 120-300 f/2.8 OS HSM @ 270mm, Nikon D4, manual mode, 1/2000th s at f/5.6, ISO 640, Manual mode, handheld. Even though I have shot this for what seems like the millionth time, I still love the fully extended wings forward eagle bank. For this session the cloudy sky gave us super soft light and nice soft backgrounds. More images and details coming soon in the second part of this report including 2015 tour dates!